“ Including the ExtraOrdinary Technology Conference "
Integrity Research Institute, sponsor of COFE11, is collaborating with the ExtraOrdinary Technology Conference and TeslaTech, LLC, which presents a four-day conference event that includes a two-day COFE11 in the middle on August 9-10, 2019 with an extra joint plenary 90-minute presentation on Saturday night August 10th at 7 PM with Dr. Bruce Cornet. Dr. Cornet is a PhD geologist who has had years of industrial research and academic teaching experience. His talks will focus on the unconventional craft which he has witnessed in his field experiences. COFE traditionally fulfills the mission statement of Integrity Research Institute to "research scientific integrity in the areas of energy, propulsion, and bioenergetics" so original papers on those vital topics are invited on the topics of energy, propulsion, bioenergetics. email: iri@erols.com . Questions, inquiries for potential exhibitors are accepted by email. Free admission for young people under 21 (student or not). It also includes FREE admission to the concurrent ExtraOrdinary Technology conference going on down the hall if you are 21 and under. It does NOT include admission the evening Social with pizza and a special plenary speaker's presentation starting Wednesday at 5 PM and following evenings starting at 7 PM for only $20/night separate Social/Food ticket. The COFE11 preliminary Speaker biography, abstracts, and Schedule is posted online and updated regularly. The conferences will be held at Crowne Plaza Albuquerque, 1901 University Blvd NE, Albuquerque, NM 87102, 505-884-2500. Mention "TTI" or "TeslaTech" for the conference discount rate. Confirmed and Invited Speakers are below. Confirmed and Invited Speakers are below. We were also honored to have Gwen Holdmann, Director of the Alaska Center for Energy and Power (ACEP) and Elaine Walker, author, musician, and chaos theorist as plenary speakers. *Moray King "Plasma Ion Oscillations and Vacuum Energy"
*Bob DeBiase "Quantum Fire Project with SEM Designs"
*Bill Alek "An Introduction to Faster Than Light (FTL) Starship Design"
*Mike Gamble "Control Moment Gyroscope Developments in Thrust Motion"
*Josh Reynolds "My Experience with New Energy Investments"
*Larry Deavenport "Building T. Townsend Brown's Flame Jet Generator"
*Glen Rein, PhD "Experiments with QUANTUM INFORMATION STORAGE IN WATER"
*Suzanne Price "NanoCrystal Electricity Technology"
*Brian Anderson "Tesla Research for Health and Well Being"
*Gwen Holdmann "Alaska's Center for Energy and Power is a Model of Sustainable Technology"
*Elaine Walker "Matter Over Mind: Cosmos, Chaos, and Curiosity"
*Thorsten Ludwig "Summary of Future Energy Trends"
Don Reed "Proof-of-Principle of Scalar Electrodynamics"
Russ Anderson "Electrostatics: Advanced Tech for Land, Sea, and Aerospace"
*Tom Valone "Future Energy Technology that will have Public Impact"
Harold "Sonny" White "NASA Warp Drive Research for Rapid Interstellar Travel"
*Dr. Glen Rein - speaking on "ELECTRICAL PROPERTIES OF DNA AND ITS SENSITIVITY TO SUBTLE ENERGY"
*Dr. Nirmala Khandan - confirmed professor speaking on "Harvesting Net Energy from Urban Wastewater" developed locally in Las Cruces NM at the Arrowhead Center, Inc.
*Dr. James Purvis - Confirmed speaker on "Electromagnetic Angular Acceleration and Segmented-Capacitor Propulsion Systems"
*Thomas Valone - backup speaker - "Energy Breakthroughs Expected to Have a Public Impact"
The dual, concurrent conferences will be held at the Embassy Suites near downtown Albuquerque, NM. Preregistration rates to be posted. Embassy Suites special conference rate is $94 per night. Hotel Reservations 800-362-2779. HOTEL reservations conference code is "TTI" . NOTE: You receive FREE admission to the ExtraOrdinary Technology conference during the two days of COFE9 with your COFE9 registration! 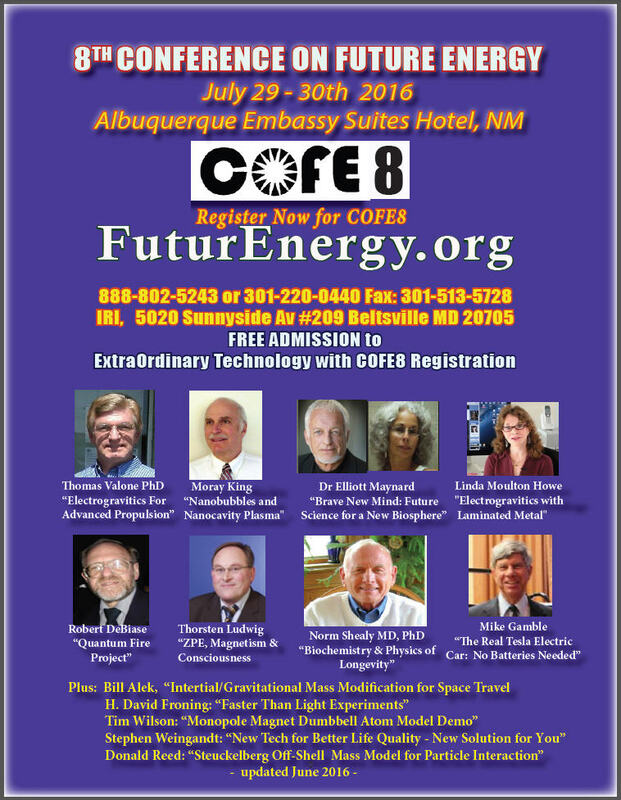 COFE8 was held on July 28-30, 2016 in Albuquerqu NM in conjunction with the ExtraOrdinary Technology Conference. 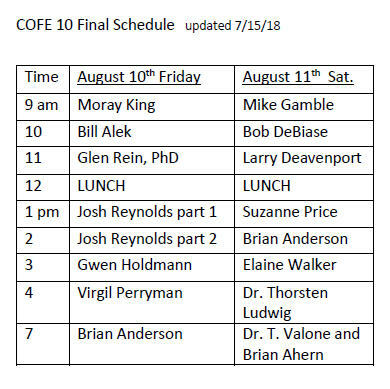 Click here for a nice illustrated review of COFE8 or click here for the Master Program for COFE8 with Titles, Abstracts, and Biographies of ALL of the speakers! Integrity Research Institute, sponsor of COFE8, is collaborating with the ExtraOrdinary Technology Conference and TeslaTech, LLC to present a two-day conference event with peer-reviewed published proceedings on July 29 and 30, 2016 with an extra introductory talk on July 28th at 5 PM. 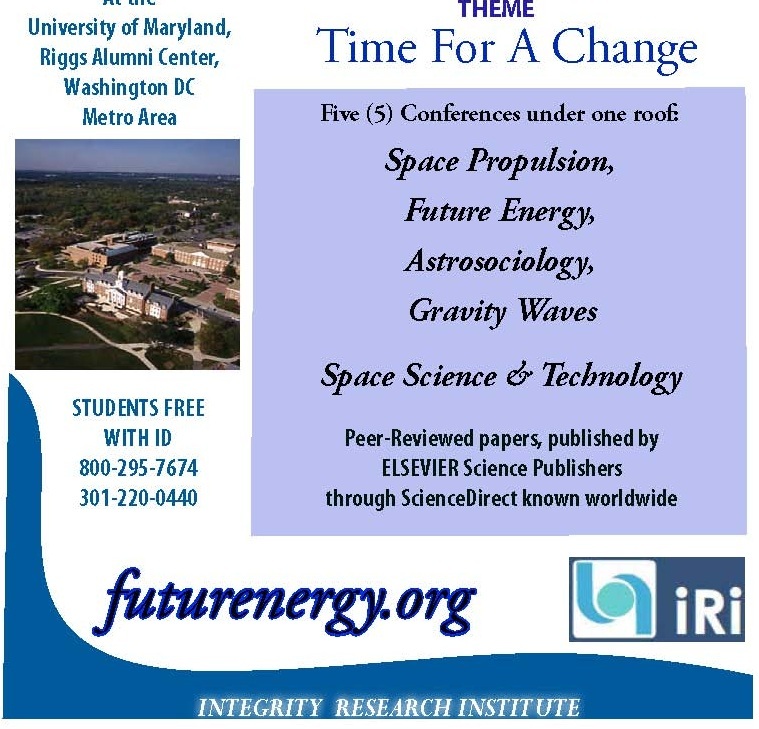 COFE traditionally fulfills the mission statement of Integrity Research Institute to "research scientific integrity in the areas of energy, propulsion, and bioenergetics" so original papers on those vital topics are presented on the topics of energy, propulsion, bioenergetics. Email: IRI@erols.com . Questions or inquiries are accepted by email. Free admission for young people under 21 (student or not). It also includes FREE admission for the 29th and 30th to the concurrent ExtraOrdinary Technology conference going on down the hall if you are 21 and under. It does NOT include admission the evening Social with pizza and a special plenary speaker's presentation starting Wednesday, July 27 at 5 PM and following evenings starting at 7 PM for only $20/night separate Social/Food ticket. Click here for a one-page COFE8 poster listing confirmed speakers for the conference. 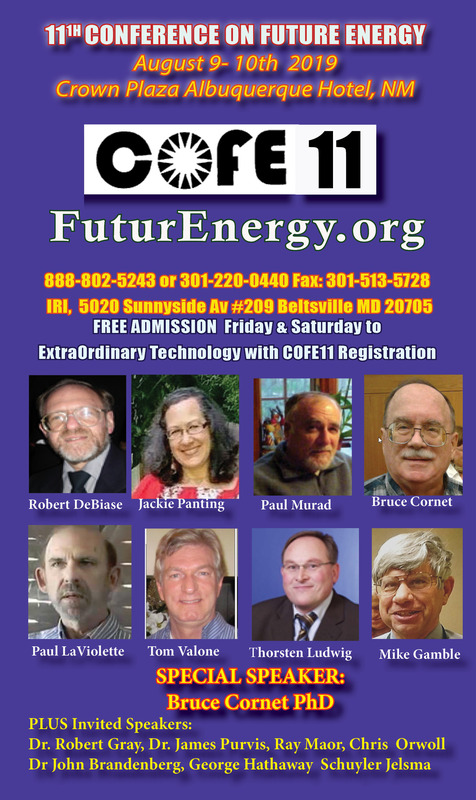 “ Including ExtraOrdinary Technology Conference "
Review of COFE7 in Future Energy eNews, August, 2015. COFE7 Slideshow movie (5 minutes) with music mp4 format . The dual, concurrent conferences held at the Embassy Suites near downtown Albuquerque, NM. Preregistration rates to be posted. Embassy Suites special conference rate is $94 per night. Hotel Reservations 800-362-2779. HOTEL reservations conference code is "TTI" . Note: A few COFE speakers appear in SPECIAL, shared, joint sessions like Dr. Tom Valone (July 29 at 5 PM), Dr. Nick Simos (July 31 at 7 PM), and Mike Gamble (Aug. 1 at 4 PM). COFE attendees will have special admission to those events though they occur in the ExtraOrdinary Tech ballroom. Questions or inquiries are accepted by email . As to remote presentations, we use Adobe Connect which is easy for slides, audio and video. IRI has published (see below) the Proceedings of COFE with Elsevier or World Scientific publishers and will contract with them again or other similar, widely distributed ScienceDirect-affiliated publishers of conference proceedings. Your original and unpublished paper is vital to making this record of the conference a lasting success. Guidelines for formatting the paper will be posted shortly. Click on the links below for select slideshows from COFE7. These are great examples of real scientific progress being made by our presenters. Order their DVDs on our Products link on the IRI homepage. “ Including 20th Natural Philosophy Alliance Conference "
Integrity Research Institute, sponsor of COFE6, collaborated with the highly successful Natural Philosophy Alliance for this conference event July 11-13, 2013. But what is "Future Energy" you might ask? A credible summary is provided by Gary Vesperman for example, who just published in 2013 a 33-page report for investors on "Clean Energy Inventions", none of which use fossil fuels and many are worthy of further research and investigation. Our joint NPA-COFE6 conference was held at the University of Maryland. 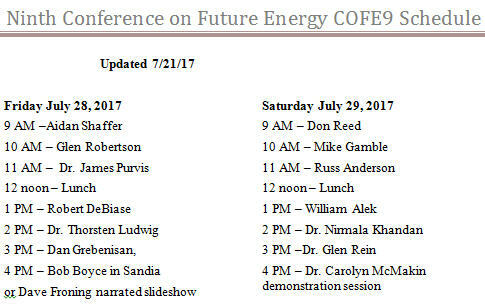 Our Conference Summary for the Sixth Conference on Future Energy is updated and online. Our emphasis is on emerging energy developments, propulsion research, and bioenergetics. We are happy to share the webcast recordings as well, which open with RealPlayer. It is suggested to "Save Target As" and select "all files", then add ".flv" at the end of the file name, to ensure saving it as a Flash Video, or simply change the extension after saving to ".flv" so it will be playable. University of Maryland campus maps are online: full color map in pdf and my favorite, the 2013 3D black and white 11x17 size map also in pdf. Students full registration or single day registration was FREE with student I.D. Everyone else may register here. One low fee for admission to both conferences, demonstrations (Thursday night) and exhibit hall! Note on the NPA site, authors may choose to publish in the NPA Proceedings ($15/page) and/or the COFE6 Proceedings (free). There is no cost to submit a paper to IRI for the COFE6 online proceedings this year. WEBCASTING: We are using Adobe Connect, a professional, high-bandwith Internet based service that shows the PowerPoint slides very clearly, audio AND video of the speaker. Simply click here on Thursday or Friday morning to join our conference. Please join as "Learner" or "participant" only. No credit card needed! Physics theories and experiments, Human Missions to Mars, New Energy, Propulsion, NASA advanced concepts, Bioelectromagnetics, Inertial Gyroscopic Propulsion, Gravitomagnetics, Antigravity, Podkletnov effect, Space Elevators, Beamed Power, Nuclear propulsion, Toroidal coils, Coler apparatus, Low Energy Nuclear Power, Water Electrolyzers, Maglevs and Space Habitats and more. (3) Reasonable registration fees and very reasonable hotel rates. Many of the hotels are within walking distance of the campus and also offer shuttle service. Parking is available in the Union Lane Garage next door to the Student Union for $3 per hour with a maximum of $15/day or in the Student Lot (Lot # 1) for $8/day pre-registered with the NPA or $10/day onsite parking pass. View the NPA-COFE6 Poster and view the very impressive and scientifically amazing NPA posting of over 90 abstracts . We are grateful for all of you who contributed to this event and made it possible. The Flash FLV videos of most of the SPESIF presentations are also online (see below) and stored chronologically for online viewing, as converted from Adobe Connect. SPESIF-COFE 5 Proceedings are available online (see above for link or contact IRI at 301-220-0440 to inquiry). IRI is proud to emphasize the exclusive breakthrough discoveries of Mike Gamble and Garret Moddel that were presented at SPESIF 2012. View ALL of the SPESIF2011-COFE4 papers and download ANY of them for FREE (pdf): Physics Procedia - ScienceDirect (c) Elsevier B.V.
Click to see all SPESIF-COFE4 presentation papers on CD which are still available. Visit our IRI ORDER PAGE to order the Proceedings or DVDs from the 2011 COFE4 conference. Thomas Valone, Conference Co-Coordinator, Tech and Pub Chair and Moderator, John Falker (NASA), Harry Partridge (NASA), H David Froning, George Miley, Paul Werbos, David Nagel, Qingbin Cui, Judy Kosovich, Chia-Ying Chiang, Robert Fresco, Ekaterina Pomerantseva, Thorsten Ludwig, Curt Renshaw, Alex Howerton, Marshall Eubanks, Paul Potter, Sam Wanis, J.C. Bass, James Putnam, Philip Bouchard, Alex Dmitriyev, and many more. 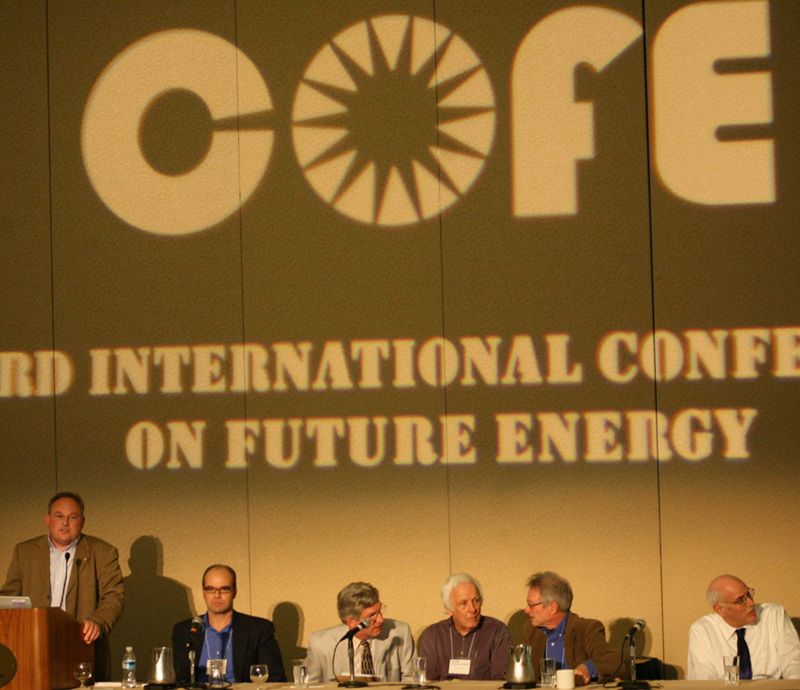 View the summary page for the Second International Conference on Future Energy, held in 2006, which also included a movie screening of "Who Killed the Electric Car?" and a personal lecture by its star Chelsey Sexton. View the complete summary of the successful First International Conference on Future Energy, held in 1999, which caused a sensation in the media since it was planned by invitation at the US State Department. 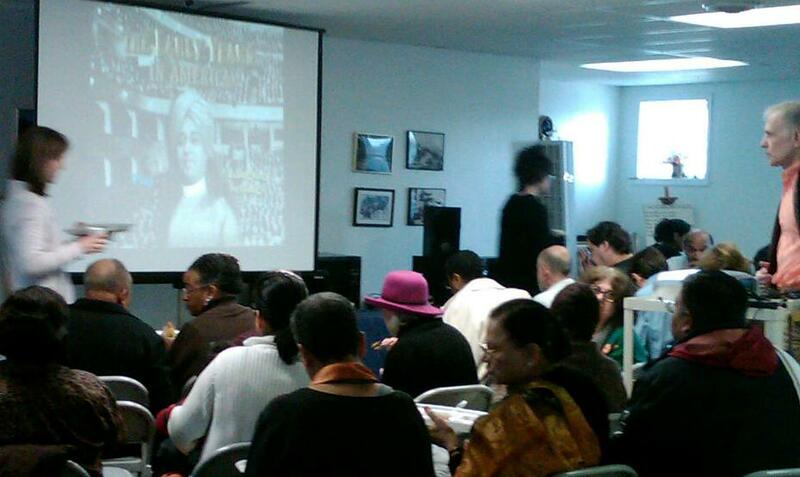 Copyright© 2011 Integrity Research Institute, 5020 Sunnyside Avenue, Suite 209, Beltsville MD 20705. All rights reserved.